Santa Clara’s Digital Game Museum came across a near-complete version of the cancelled Atari 2600 version of arcade classic Xevious. Behold the primitive glory of what passed for a console port in the early ‘80s. 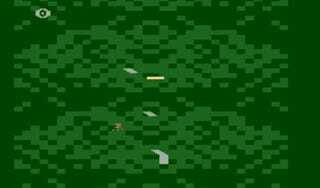 For those of you that haven’t been alive and gaming for as long as I have, Xevious was a scrolling arcade shooter released in 1982 by Namco. With sharp graphics and relatively frenetic action, it was one of my go-to games whenever I’d steal quarters from my grandmother’s purse and hit up the local arcade. Here’s a look at the arcade version, courtesy of Old Classic Retro Gaming. As it did with many popular arcade titles, Atari had planned ports of Xevious for both the Atari 2600 and 5200. Both were cancelled in 1984. In progress versions of the 2600 version have been floating around since, but have lacked a title screen, final sprites, enemy waves, and music. Then this showed up at the Digital Game Museum as part of a donation of Atari memorabilia. It’s got everything earlier prototypes were missing. Titles, sound—everything. It’s an incredibly impressive find, even if the game itself looks pretty ridiculous by today’s standards. Sure it’s silly now, but back in the day I would have killed for a chance to play this. Digital Game Museum has teamed up with video game and pinball convention California Extreme to insure visitors to the show this weekend won’t have to kill a single person. Visitors will be able to play the newly-discovered classic on an Atari 2600 system, with a full arcade version standing by for comparison’s sake. Oh yeah, that’s the stuff right there.